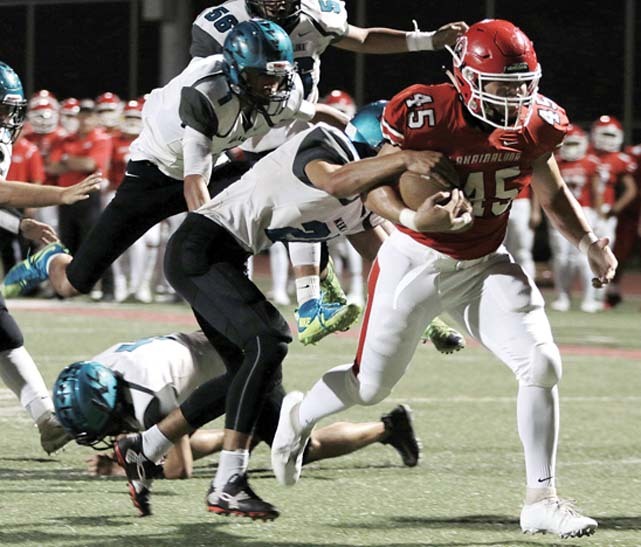 The Lahainaluna High School football team has entered territory never before traveled by a Maui Interscholastic League team. This afternoon at 4:30 p.m. at Sue Cooley Stadium, the top-seeded Lunas will face Roosevelt in a First Hawaiian Bank Division II State Championship semifinal in their quest for a third straight state title. The winner will advance to the championship game next Saturday at Aloha Stadium. Roosevelt coach Kui Kahooilihala knows his team is in for a tough test. The Rough Riders (11-2) won the first Oahu Interscholastic Association football title in school history and then downed Pac-Five in last week’s state quarterfinals 20-7 while the Lunas had a bye. — The two-time defending state champions are the only MIL football team to win multiple state crowns. — The Lunas have won 19 games in a row overall, their last loss coming against Kamehameha Kapalama 34-10 in a nonleague game to begin the 2017 campaign. — In MIL play this season, they outscored their opponents 313-19 over eight games. — In MIL team statistics, they finished second in total offense at 362.3 yards per game. That was 15 yards per game behind Kamehameha Maui, but the Lunas often emptied their bench in the second half of blowout wins. — On defense, they were untouchable, giving up just 109 yards per game, 193.2 yards per game better than second-best KS Maui. The Lahainaluna defense surrendered just one touchdown in eight MIL games — in a 34-7 win over Baldwin on Sept. 22. The other TD scored against Lahainaluna came on a defensive fumble return. Roosevelt runs a veer option offense that is not like anything the Lunas have seen this season. “You have to play real good assignment football,” Tihada said. The Lunas have played just one game since clinching their 12th straight state berth with a 47-0 win over Kamehameha Maui on Oct. 12. 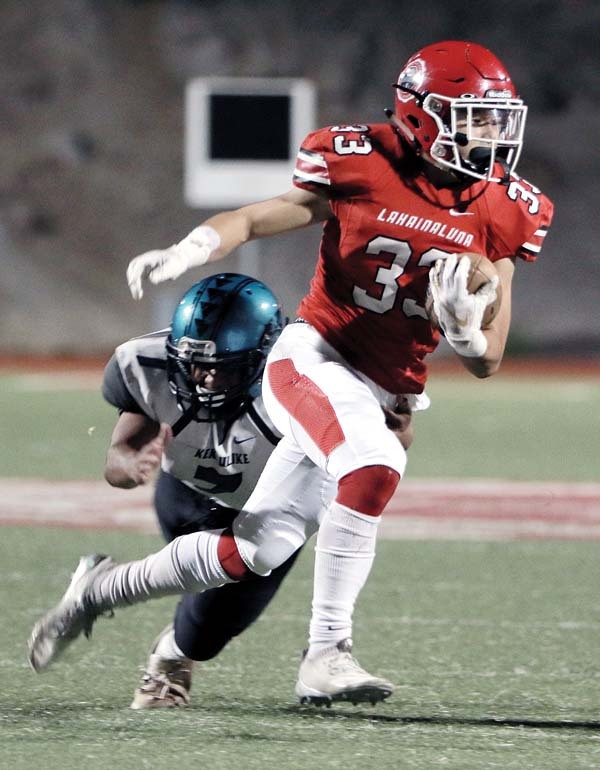 It is a sure bet that the Lunas will get the ball to junior running back Joshua Tihada as much as possible, be it on handoffs, passes or on direct snaps in the wildcat formation. Joshua Tihada, who is the son of Lunas assistant coach Joey Tihada, finished third on the MIL rushing list with 796 yards on 112 carries and second in scoring with 14 touchdowns. He has 10 TDs in state tournament games, which is second all-time, trailing only B.J. Batts, who had 12 touchdowns in state tournament games for Saints Louis. Garret Tihada, Joey’s cousin, is excited for the West Maui community’s chance to see their team play a state tournament game at home for the first time since a 7-0 win over Kaimuki in 2015. Garret Tihada said there is one big difference between this team and all the others: academics. They set an unofficial school record with 30 players recording at least a 3.0 grade-point average in the first quarter, four of those were straight-A’s at 4.0 or higher. Kaimuki vs. No. 2 Kapaa at Vidinha Stadium, 2 p.m.
No. 4 Roosevelt at No. 1 Lahainaluna, 4:30 p.m.
Division II championship, 1:30 p.m.